Retail pioneer recognised for the innovative City Centre’s mobile app and outstanding 2015 Monopoly campaign. Majid Al Futtaim has been awarded two prestigious awards at the MENA Digital Awards 2016 (MDA) and the Festival of Media Awards MENA 2016. The retail pioneer won in two categories: “Best Mobile App” for City Centres’ mobile app at the MDA, as well as “Best Engagement Strategy” for the Corporate Sustainable Responsibility angle of the 2015 Monopoly campaign at the Festival of Media Awards MENA. At the MDA, the “Best Mobile App” category recognised the best mobile app in terms of originality, how beneficial it is to its users, accessibility and efficiency, innovation in technology as well as UX and overall design. Majid Al Futtaim also received the Bronze Award for the sustainability layer of its 2015 Monopoly campaign under the “Best Engagement Strategy” category at the Festival of Media Awards MENA. Majid Al Futtaim was the only shopping malls group shortlisted during the Festival of Media. The recognition demonstrated the importance of a superior consumer experience delivered through activations paired with an innovative approach for media. The campaign successfully merged ‘gaming’ with ‘giving’, creating memorable moments for all those who participated and raised more than AED 1,800, 000 (USD 500,000) for rebuilding houses in Nepal after the 2015 earthquake. “Mobile technology is set to grow in importance and play a vital role in the consumer shopping experience. As an industry leader, Majid Al Futtaim is always looking for new ways to innovate and offer its customers experiences that go beyond their expectations. 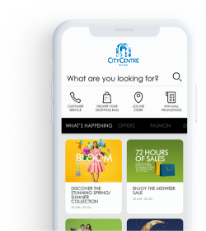 The recognition of City Centres’ mobile app confirms our standpoint that using innovative technology infused with originality, and with consumer experience always top of mind is the way forward,” said Fuad Mansoor Sharaf, Senior Director – Property Management, Shopping Malls for Majid Al Futtaim properties. “In line with the company’s vision to create great moments for everyone, everyday, and we will continue to deliver added-value experiences for our visitors. A perfect example of this vision brought to life is our Monopoly campaign. We brought a giant version of the world famous game to the region for the first time two years ago, and won several awards for its marketing excellence and innovation. We are very proud to have been recognised for the success of its charitable angle, as our visitors thoroughly enjoyed the experience and were able to make a difference by helping others in need at the same time,” he added. Majid Al Futtaim has also been shortlisted to win a Global Award for “Not Just Special but Super” campaign with Al Noor foundation at the Festival for Media Global Awards, for which is a notable acknowledgement as only four brands from the region were selected for the global award. The MENA Digital Awards (MDA) the first awards show to promote digital innovation and media in the MENA region. MDA recognizes excellence in the use of digital technologies and media that takes the communication industry to the future. The Festival of Media MENA Awards is the only awards dedicated to the evolution of media, celebrating the best in media thinking and communications across the MENA region. Senior level executives from the world's biggest brands, marketing and media agencies, join together to network and learn about the latest trends and techniques in the industry.